In this section, you will learn about model binding in MVC framework. To understand the model binding in MVC, first let's see how you can get the http request values in the action method using traditional ASP.NET style. The following figure shows how you can get the values from HttpGET and HttpPOST request by using the Request object directly in the action method. As you can see in the above figure, we use the Request.QueryString and Request (Request.Form) object to get the value from HttpGet and HttpPOST request. Accessing request values using the Request object is a cumbersome and time wasting activity. With model binding, MVC framework converts the http request values (from query string or form collection) to action method parameters. These parameters can be of primitive type or complex type. HttpGET request embeds data into a query string. MVC framework automatically converts a query string to the action method parameters. For example, the query string "id" in the following GET request would automatically be mapped to the id parameter of the Edit() action method. This binding is case insensitive. So "id" parameter can be "ID" or "Id". You can also have multiple parameters in the action method with different data types. Query string values will be converted into paramters based on matching name. For example, http://localhost/Student/Edit?id=1&name=John would map to id and name parameter of the following Edit action method. Model binding also works on complex types. Model binding in MVC framework automatically converts form field data of HttpPOST request to the properties of a complex type parameter of an action method. Consider the following model classes. Now, you can create an action method which includes Student type parameter. 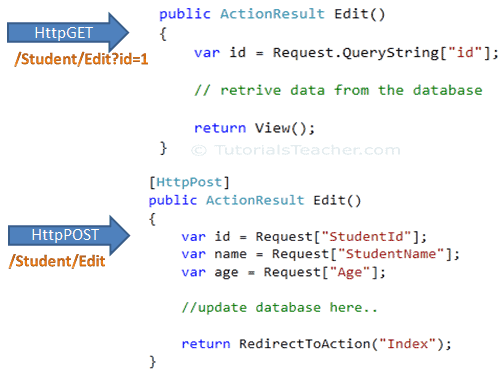 In the following example, Edit action method (HttpPost) includes Student type parameter. So now, MVC framework will automatically maps Form collection values to Student type parameter when the form submits http POST request to Edit action method as shown below. So thus, it automatically binds form fields to the complex type parameter of action method. You can also include FormCollection type parameter in the action method instead of complex type, to retrieve all the values from view form fields as shown below. ASP.NET MVC framework also enables you to specify which properties of a model class you want to bind. The [Bind] attribute will let you specify the exact properties a model binder should include or exclude in binding. In the following example, Edit action method will only bind StudentId and StudentName property of a Student model. You can also use Exclude properties as below. The Bind attribute will improve the performance by only bind properties which you needed. As you have seen that Model binding automatically converts request values into a primitive or complex type object. Model binding is a two step process. First, it collects values from the incoming http request and second, populates primitive type or complex type with these values. Value providers are responsible for collecting values from request and Model Binders are responsible for populating values. MVC includes DefaultModelBinder class which effectively binds most of the model types. Visit MSDN for detailed information on Model binding.